The Halloween image is one of rabid bats that are bloodthirsty predators, preying on terrified humans. Not likely to happen. Their nightly diet consists of mosquitos and other pesky insects. 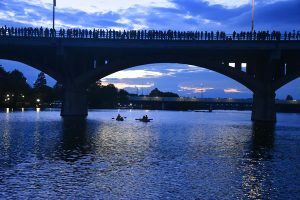 Bats are a big deal, even big business, in Austin. The bats are a major part of Austin’s life from March to October. An estimated 1.5 million migrating Mexican free-tail bats take up residence under the bridge. They have spawned an eco-tourism niche that, by several estimates, contributes $10-million to the local economy every year. 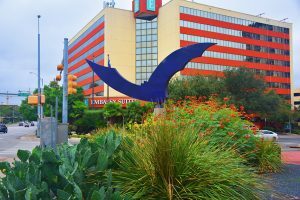 According to Dewitt Peart of the city’s Downtown Business Alliance, “bats are an iconic feature of the city for residents and visitors alike.” He estimates they draw 100-thousand visitors to the downtown area annually. 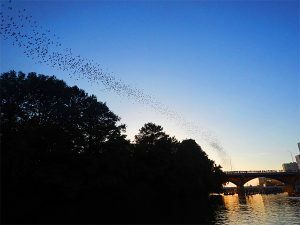 The bats are so important to Austin that years ago bridge engineers made modifications under the bridge to form extra roosting areas to accommodate more and more bats. 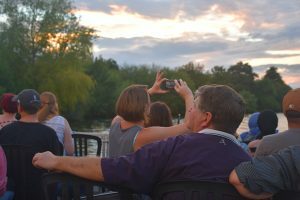 Perhaps the biggest cottage industry spawned by the bats is the tour boat business that nightly takes customers out on the lake to witness the bat flight. The night I rode on a Lone Star bat boat there were visitors from Pennsylvania, California, even China. Our trip was hampered by rainy weather, and the bats didn’t cooperate, just fluttering around under the bridge, but not swarming out for their evening feast. The bats are mostly females, who give birth to one pup a year. Typically, about the size of a kitchen sponge, they have a wingspan of less than a foot. The bats are such a big deal here that the Bats Conservation International organization has its headquarters in Austin. According to Katie Jepson, content producer for batcon.org, the Austin colony has so far escaped the White Nose Syndrome, which has devastated bat colonies elsewhere.